Film Abbreviations & Terms: Click to View or Add Text. Enter part of a movie or TV quote and click "Go" to search the quotes at imdb.com. Mailing List & News -- subscribe yourself! Directing is nothing but praxis (application of film-philosophy, i.e. analysis)! Part I sould be directing, as (more) primitive field. ... move it all (analysis) to film.vtheatre.net? Part I -- analysis or directing? Students: you MUST write, shoot, direct and edit your first film! Yes, I had to break filmplus.org into two: film analysis and directing (part II); too many pages. I teach theatre (and direct), film manor is my "bonus" to UAF (my MFA from Moscow Film Institute, VGIK), but since I teach film classes, I keep my notes (and this is what you have -- just notes). Mostly two courses: THR334 Films & Movies and THR470 Film & Video Directing (both with some prereq.) -- NTL, both are rather "intro" to film. "Films & Movies" -- theory, "Directing" -- practical applications. I am self-taught webmaster and webpages are no more than a by-product of teach (and some research -- "virtual theatre" and/or "spectatorship theory") -- therefore, my pages are not most user-friendly (I tried my best). I updated pages while I am teaching a class, come for updates! Flash banner "film.vtheatre.net" takes you to Film Analysis pages. New big and tall popup windows slideshow select pages (like the one that came out with this page). Well, this is in theory, of course. Other signs and symbols are self-explanatory: film books and etc. Oh, yeah! 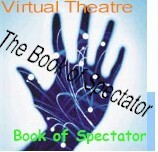 Virtual Theatre! Several symbols, depending of what aspect of VT is in focus -- stage, film, web and etc. Books directories. Film : filmplus.org/books... Easy to remember? Theatre: vtheatre.net/books -- you see the logo in the right table (not everywhere). Plays: plays.vtheatre.net -- did you see this flash banner? Well, this directory for my new plays-in-progress. In Russian. You are in English directory: filmplaus.org/plays (click -- and you will get to the title page). Web: web.vtheatre.net and the flash banner with the same URL. Wait! SHOWS: shows.vtheatre.net -- no logo? I can't believe it! 334 Film Analysis: Click to View Links. Film History: Click to View Links. Copyright © 2007 by filmplus.org. Permission to link to this site is granted.